Fisheye: Apply this tool to distort the image so that it appears to have been taken with a fisheye lens. The look is similar to what you see when you look through a security peephole in a door. Cross Screen: This tool adds a starburst effect to the brightest part of the image. To access it, choose the Filter Effects option on the Retouch menu. Soft: Also accessed via the Filter Effects option, the Soft filter blurs your photo to give it a dreamy, watercolor-like look. Image Overlay: This option enables you to select two Raw images and then overlay one over the other to create a composite image that shows each original at half opacity. The figure shows an example. The composite image is saved in the Raw format, so if you have the urge, you can select the composite Raw image, select another Raw image, and combine those images into a new composite. You can merge as many photos as you want; just remember that this tool works only with Raw (NEF) originals. 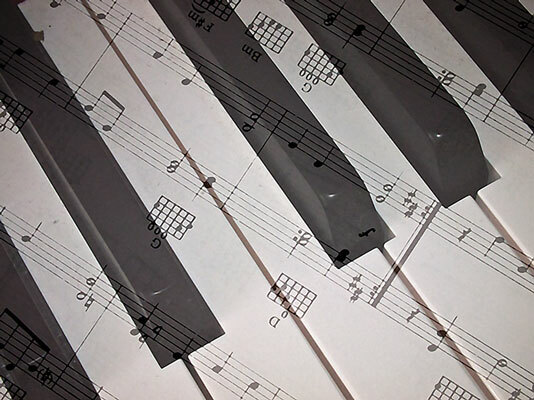 Image Overlay is used here to blend a photo of piano keys with a picture of sheet music. Image Overlay isn’t available from the i-button menu that’s available during picture playback. You must use the standard menu process: Press Menu, open the Retouch menu, and choose Image Overlay. Also understand that you can’t adjust the positioning or the opacity of the images in the composite. So if you enjoy creating this type of imagery, you’re better off using a photo-editing program that provides more sophisticated compositing tools. Photo Illustration: This effect produces a cross between a photo and a bold, color drawing. Color Sketch: This filter creates an image similar to a drawing done in colored pencils. Miniature Effect: Have you ever seen an architect’s small-scale models of planned developments? 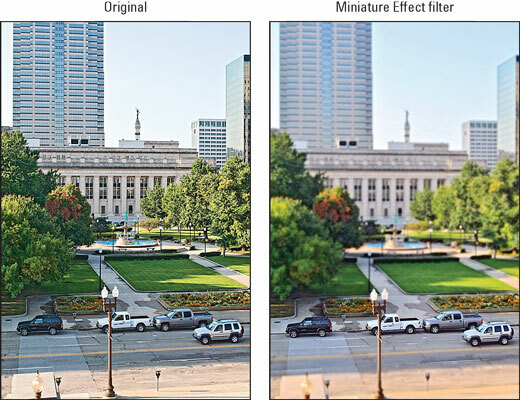 The Miniature Effect filter attempts to create a photographic equivalent by applying a strong blur to all but one portion of an image. (When you apply the filter, you indicate the area you want to keep in focus by moving a yellow frame over that part of the photo.) This figure offers an example. The left photo is the original; the right shows the result of keeping focus sharp in the part of the street occupied by the cars. The Miniature Effect filter works best if you shoot your subject from a high angle @@md otherwise, you don’t get the miniaturization result. Selective Color: This effect desaturates (removes color from) parts of a photo while leaving specific colors intact. For example, in an image of a red rose against a green background, you might desaturate the background and leave only the rose petals in color. Not only is this tool less than intuitive to use, but it’s also difficult to precisely adjust only specific parts of the image. First, it affects all objects that have the same colors as the ones you choose to desaturate. So, for example, if there’s a red ball in the background that you’d like to turn black and white along with the green grass, you’re out of luck. Also, if there is any green (or greenish tones) in the rose, those, too, become gray. For this kind of effect, you really need to do the job in a photo-editing program so that you can accurately select the parts of the photo you want to change. Painting: The last special effect on the Retouch menu, this one produces a vividly colored, loosely rendered version of your photo.